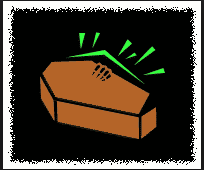 Explanation: A coffin is the box that dead people are buried in. Coughing is the body’s natural response when there is a tickle in the throat and you try to clear it- you cough. This joke is funny because it plays on the similar sound of “coffin” and “coughing.” In English, many people drop the final ‘g’ sound on words ending in ‘ing.’ That makes “coffin” and “coughing” sound even more alike. Don’t let your coughin’ send you to the coffin! See a doctor! This entry was posted in humor, Joke, jokes, jokes explained, kids jokes, reading, writing and tagged cofffin, cough, joke, jokes, kids, kids jokes, reading, writing. Bookmark the permalink.